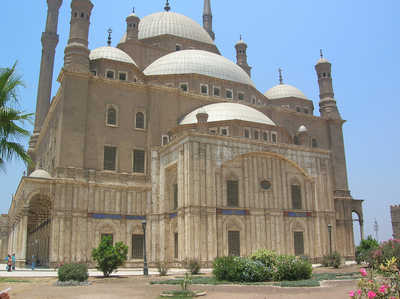 The 19th c. CE Mehmet Ali Pasha Mosque, Cairo -- Photograph 2008 Via Wikimedia Commons. On May 23-24, the "new Egypt" will hold its first presidential election. Voters will be presented with a daunting list of candidates, currently totaling 12 individuals, with five in the lead. If there is no clear victor, a second round of balloting will take place on June 16-17. Of the main contenders, two are associated with the Muslim Brotherhood (MB), the Islamist movement founded in Egypt in the 1920s. They are the official MB standard-bearer, Mohamed Mursi, and an expelled MB figure, Abdel Moneim Abul-Futouh. Mursi, the chairman of the MB's Freedom and Justice Party (FJP), replaced Khairat al-Shater, a business executive and prominent MB politician, who was disqualified from running by the Egyptian authorities. The remaining three credible personalities in the race are Amr Moussa, former secretary-general of the Arab League and ex-foreign minister under the deposed Hosni Mubarak; Ahmed Shafiq, the last prime minister in the Mubarak government, and Hamdeen Sabahi, standing on the legacy of the charismatic pan-Arab leader Gamal Abdel Nasser. Pre-electoral polling samples have been inconclusive. The Egyptian daily Al-Ahram credited Amr Moussa, who enjoys the highest degree of name recognition, as leading, followed by Shafiq, with the MB's Mursi and the ex-MB member Abul-Futouh in the third and fourth places. According to BBC News, a more recent survey placed Shafiq in front, followed by Moussa, with Mursi and Abul-Futouh still behind them. The MB/FJP and the so-called "Salafi" (i.e. Wahhabi) Hizb ul-Nur or "Party of the Light" won, together, a striking majority in the Egyptian parliamentary elections of November 2011 and January 2012. The FJP gained some 38 percent of votes, while the "Nur" obtained about 28 percent. The Wahhabis in the "Nur" did not put forward a presidential candidate, but were expected to assist an independent Islamist, sheikh Hazem Salah Abu Ismail. Sheikh Abu Ismail was also disqualified. Both the FJP and the "Nur" party have betrayed ambiguous attitudes toward the presidential race. The FJP promised originally that it would not present a candidate, which caused its rift with Abdel Moneim Abul-Futouh, who favored an FJP campaign for the chief executive's position. The Brotherhood then announced that Mursi would serve as its nominee. As Wahhabis, who until now eschewed parliamentary elections and other democratic practices, the "Nur" party seemed baffled by the removal of sheikh Abu Ismail from the contest, but then transferred its backing to the former MB member, Abul-Futouh. Although grouped together in Western media as "the Islamists," the FJP and the "Nur" have not formed a close alliance. The "Nur" supports Abul-Futouh, considered by many Egyptians as a liberal and modernist exponent of Islamist ideology, although the "Nur," being a Wahhabi trend, envisions an Egyptian version of Saudi Arabia's rigid and retrograde social structure. The "Nur" has been plagued by controversy, including the revelation that Anwar Al-Balkimi, one of its parliamentary deputies, had undergone plastic surgery – a "nose job" – which is forbidden by Wahhabis. The fundamentalists claim that cosmetic medical treatments are prohibited in that they alter the divinely-created human form. Yet they are known to impose surgery to "restore" the virginity of women, while justifying the brutal practice of female genital mutilation. Abul-Futouh has been described as the candidate of all those who do not like the MB-FJP or the military regime that continues to govern. Such an array would include Wahhabis, liberals, and leftists. He has been endorsed by Wael Ghonim, the now largely-forgotten computer engineer whose emotional appearance on Egyptian television accelerated the resignation of Mubarak. In this respect, Egypt seems to resemble France, the Netherlands, and Greece, where the radical left and radical right have each attracted voters disaffected with the established parties. But apparent enthusiasm for Abul-Futouh by the "Nur," and conspiratorial speculation that his expulsion from the MB was inauthentic, have created suspicion about him. How, many ask, can Wahhabis, liberals, and leftists agree on a political option? The MB's Freedom and Justice Party and its aspirant, Mohamed Mursi, have adopted the manner of the Justice and Development Party, or AKP, in Turkey, led by the "soft" Islamist prime minister Recep Tayyip Erdogan. AKP won national elections three times in a country that epitomized Muslim secularism for decades, and is allied with but not an affiliate of the MB. The Turkish party served as a patron for the Tunisian MB branch, the Ennahda or Renaissance party, and its ideological controller, Rachid Ghannouchi. Like the AKP and Ennahda, the Egyptian FJP emphasizes its alleged moderation and pragmatism. The FJP program focuses on economic development and structural reform, the key elements in the success of the Turkish AKP; and, like Erdogan's party, the FJP appeals to the entrepreneurial class. Whether either of the Islamist candidates wins the Egyptian election cannot be predicted. More interesting for an observer of the MB and its history is that both candidates identified with its heritage, Mohamed Mursi and Abdel Moneim Abul-Futouh, represent professions in which the MB has attained organizational dominance in Egypt. Mursi is a professor of engineering and Abul-Futouh is a physician. The sociology of the Muslim Brotherhood has changed in the decades since its foundation. Originally an extreme purificationist movement that exalted violence, it was repressed severely by the Nasser government. The MB had aided the Egyptian Revolution of 1952, led by the "Free Officers" including Nasser, but turned against him when Nasser moved toward secularism and friendship with the then-existing Soviet Union. Perhaps most famously, the popularizing polemicist of the MB, Sayyid Qutb (1906-66), was executed under Nasser. After Nasser's death in 1970, the Egyptian MB renounced violence publicly and observed an unstable political coexistence with Nasser's successors, Anwar Sadat and Hosni Mubarak. Now and then, the Egyptian rulers would arrest and imprison the Brothers, some of who were behind bars when Mubarak fell. But the MB pursued an efficient strategy by penetrating the professions in which Egypt had, and has, numerous over-educated and under-employed members: medicine, pharmacy, engineering, law, and journalism. The quality of their training in an Egypt where Nasser, Sadat, and Mubarak promised, but failed to realize, major educational advances may have reduced their chances of success. The plain reality was that Egyptian society could not absorb so large a stratum of overqualified professionals, and that those who were lucky enough to find a relatively-secure place in society remained frustrated and aggrieved at the obstacles that had faced them and continued to obstruct their upward mobility. In addition, Egyptians and other Muslims – with Pakistan providing a significant parallel – who obtained secular professional status have often felt nostalgia for religion, into which they were born and which they may have largely abandoned. Becoming engineers and doctors, they may have perceived a contradiction between their religious commitment and their training in rationalist concepts. This is a mysterious aspect of the problem, since Jewish, Christian, Hindu and other doctors have shown that they can practice their healing arts without losing their faith. At the same time, Muslim doctors may be deranged by the sense that medicine gives them the power of life and death over humanity. Once established in their work, some Muslim professionals experience a desire to return to religion. Some seek a simpler, stripped-down version of Islam, that would require little study but provide uncomplicated, oversimplified, and impassioned answers to transcendent questions. Most of the newly-formed professionals in Egyptian society most certainly did not want to return to their fathers' traditional, often esoteric Islam. The MB claimed the mantle of Islamic reform, and like some other Muslim reformers before them, condemned metaphysical Sufi Islam – followed by millions of ordinary Egyptians – as a backward, superstitious, and un-Islamic accretion. Few MB leaders had or have an Islamic religious education. The MB targeted the doctors' and engineers' "syndicates," i.e. professional guilds with some attributes of a labor union. A researcher sympathetic to the MB, Amani Kandil, has written that the MB's strategy in engaging with the professions reflected awareness that the medical and engineering guilds were the places where social change had been most notable in Egypt during the last two decades of the 20th century. The MB became so powerful in middle-class and elite professional life that it was nicknamed "the engineers' union." Radical influence in the medical and pharmaceutical sectors is exemplified by the pedigree of Ayman Al-Zawahiri, the current "emir" of Al-Qaida, whose father, Dr. Muhammad Rabi Al-Zawahiri, an MB adherent, was a pharmacologist and professor at the Ain Shams University Medical School in Cairo, where Ayman Al-Zawahiri graduated as a physician. Numerous other Ain Shams University graduates and faculty have been active in Islamist movements, including the MB "general guide" until 2010, Mohammed Mahdi Akef. Akef's successor, Muhammad Badie, is a graduate of Cairo University rather than Ain Shams, but qualified in veterinary medicine. The Muslim Brotherhood was transformed from a movement of the despairing Muslim masses to a representative of the new elites in Tunisia and Egypt. But this change has not, regardless of its extensive propaganda – and that of its susceptible Western sympathizers, most of them non-Muslim "experts" – turned the MB/FJP into a moderate force. Whether by its designated choice, Mohamed Mursi, or its expelled functionary, Abdel Moneim Abul-Futouh, the MB remains a party of those who strive to survive in a makeshift middle class, fearing they have been "cheated" by inferior education or limited opportunity and will lose what status they have accrued. On the mental horizon of the ordinary MB devotee, resentment at the decline of Islamic power and the subordination of Muslim countries to Western culture is often secondary to simple anger at denial of the rewards expected from a professional education. The Egyptian Muslim Brotherhood has completed a journey from its origins as a radical-populist movement of the dispossessed to a vessel for the bitterness of those dissatisfied with their insufficiently-improved, but unarguably better, social position. In its new incarnation as a party of the Egyptian professional castes, the FJP may prove more dangerous to Egyptian society, the Muslim lands, the West, and the world at large than it was when it was merely an Islamic revivalist movement. The protesting poor who originally joined the MB saw in it an Islamic alternative to a society they believed had wandered from Muslim values to deep corruption and, indeed, to pre-Islamic ignorance or "jahiliyya," as theorized by Qutb. Having experienced the failure of almost 50 years of secular rule in Egypt, it is unsurprising that citizens allowed a free vote (if it is to be free, which is by no means certain given the interference of the military) would choose to give the "believers' party" a chance to exercise power, on the promise of greater honesty and transparency. But when the rising elites in Muslim countries like Egypt – and, for that matter, Tunisia and Turkey – engage with Islamist politics, they bear within themselves a deep anxiety, aggravated by forces beyond their borders and their control. Perhaps the FJP candidate, Mursi, or his shadow, Abul-Futouh, will win a fair count in Egypt's exercise of the electoral franchise. Notwithstanding their promises of moderation, however, the victory of an FJP, or of Abul-Futouh, driven by middle-class ambitions in Egypt, will be subject to the vagaries of the global economy. Lacking the development of civil society, the convulsions of the "Arab Spring" were nothing like the liberal and social revolutions of the 18th through the 20th centuries. Instead, they were episodes in which the chain of international economic and social relations snapped under the pressure of the worldwide crisis that began in 2007. The FJP in Egypt may find that rather than Turkey or Saudi Arabia, their country will come to resemble a case worse than that of Greece, with a devastated economy, collapse of public confidence, and poverty and deprivation far beyond what they previously suffered. It is curious that Western commentators on the global economic crisis appear to believe that the middle classes, under siege in the developed countries, can nonetheless flourish suddenly in the regions of the "Arab Spring." Muslim Brotherhood rule in Arab states lashed by the economic downturn may see their vulnerable professionals go the way of other educated, once-privileged, but suddenly disinherited "respectable people," as in Germany after the first world war. Egypt is not Germany, but the expectations of the middle classes vary seldom from one country to another. With or without the program and vocabulary of the "Islamic state" as formulated at its origins by the MB, and now demanded by the Wahhabis of the "Nur," the Egyptian MB could once again make the concept of "Islamofascism" relevant.